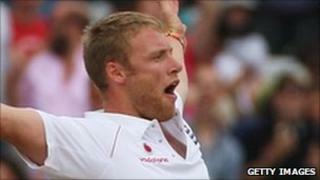 Andrew Flintoff has sparked outrage in Lancashire by joking that people in Burnley have six fingers. The former England cricket captain, who is from nearby Preston, posted the jibe on his Twitter account on Monday night. Commenting on Monday's royal visit to Blackburn, he joked Prince William "drew the line at Burnley", saying "no six-finger handshakes for Wills". Burnley Council leader Charlie Briggs said: "All I can do is stick my six fingers up to him." In his tweets, Mr Flintoff, who is known as Freddie, accused people in the town of having "extra thumbs" and not being able to read. The former Lancashire all-rounder, who retired from the game last year, had earlier made a comment about Blackburn, saying the prince was a "poor lad" for visiting the town. Prince William and Kate Middleton were in Lancashire this week on their final public engagement before their wedding. The couple visited Darwen Aldridge Community Academy and Witton Country Park in Blackburn. Mr Flintoff was in Merseyside on Wednesday, where he opened new children's rehabilitation and physiotherapy facilities at Liverpool's Alder Hey Hospital.